Using visible light, astronomers for the first time this century have detected clouds in the northern hemisphere of Uranus. The newest images, taken July 31 and Aug. 1, 1997 with NASA Hubble Space Telescope's Wide Field and Planetary Camera 2, show banded structure and multiple clouds. Using these images, Dr. Heidi Hammel (Massachusetts Institute of Technology) and colleagues Wes Lockwood (Lowell Observatory) and Kathy Rages (NASA Ames Research Center) plan to measure the wind speeds in the northern hemisphere for the first time. Uranus is sometimes called the "sideways" planet, because its rotation axis tipped more than 90 degrees from the planet's orbit around the Sun. The "year" on Uranus lasts 84 Earth years, which creates extremely long seasons - winter in the northern hemisphere has lasted for nearly 20 years. Uranus has also been called bland and boring, because no clouds have been detectable in ground-based images of the planet. Even to the cameras of the Voyager spacecraft in 1986, Uranus presented a nearly uniform blank disk, and discrete clouds were detectable only in the southern hemisphere. Voyager flew over the planet's cloud tops near the dead of northern winter (when the northern hemisphere was completely shrouded in darkness). Spring has finally come to the northern hemisphere of Uranus. The newest images, both the visible-wavelength ones described here and those taken a few days earlier with the Near Infrared and Multi-Object Spectrometer (NICMOS) by Erich Karkoschka (University of Arizona), show a planet with banded structure and detectable clouds. Two images are shown here. The "aqua" image (on the left) is taken at 5,470 Angstroms, which is near the human eye's peak response to wavelength. Color has been added to the image to show what a person on a spacecraft near Uranus might see. Little structure is evident at this wavelength, though with image-processing techniques, a small cloud can be seen near the planet's northern limb (rightmost edge). 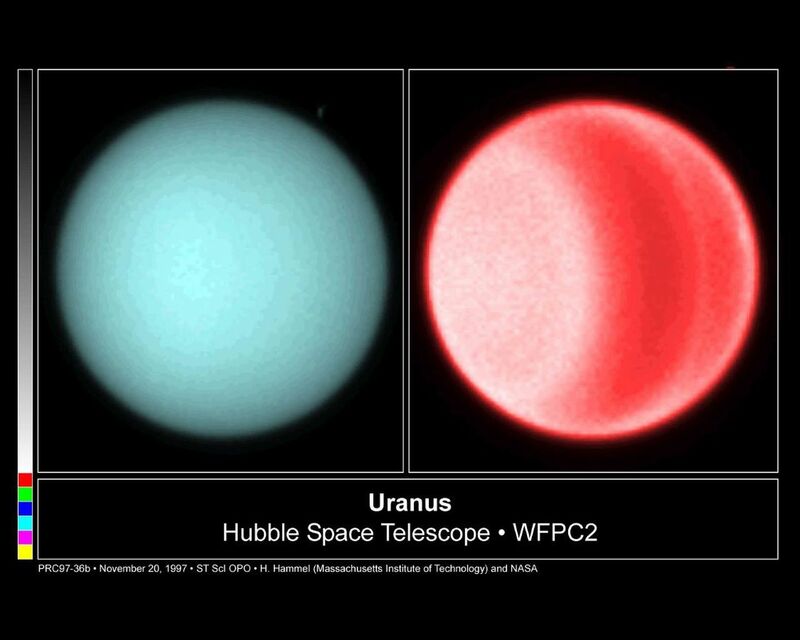 The "red" image (on the right) is taken at 6,190 Angstroms, and is sensitive to absorption by methane molecules in the planet's atmosphere. The banded structure of Uranus is evident, and the small cloud near the northern limb is now visible. 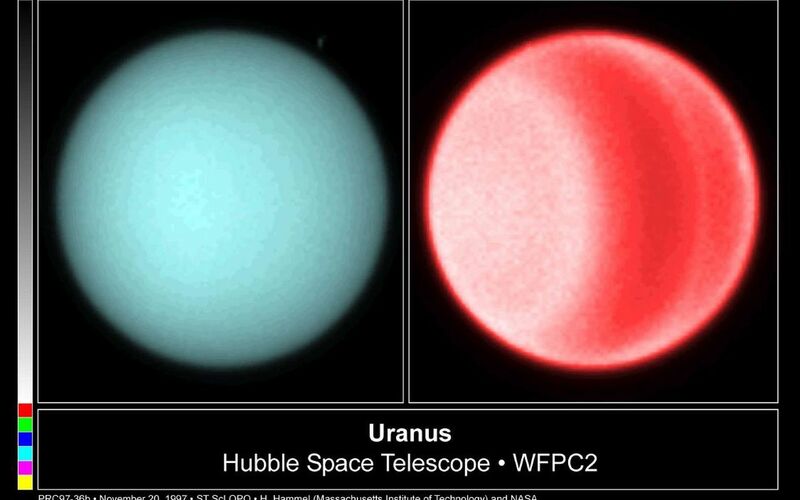 Scientists are expecting that the discrete clouds and banded structure may become even more pronounced as Uranus continues in its slow pace around the Sun. 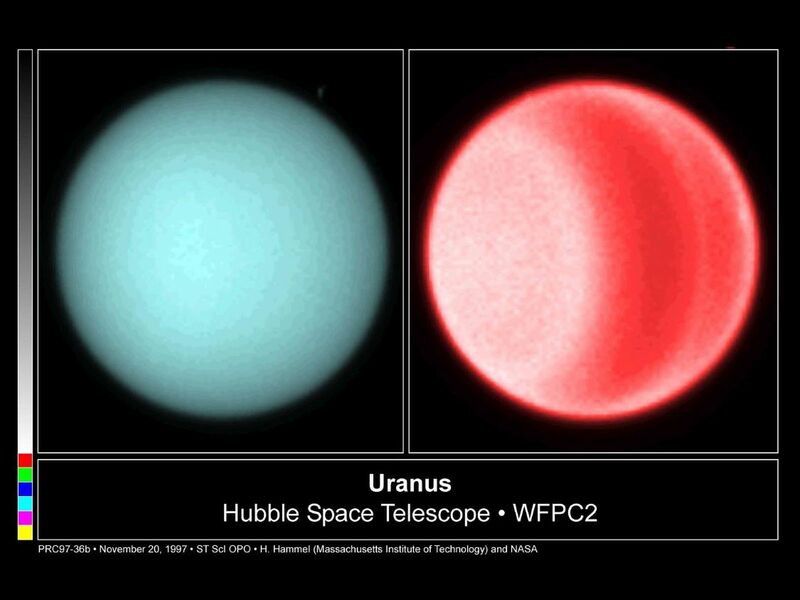 "Some parts of Uranus haven't seen the Sun in decades," says Dr. Hammel, "and historical records suggest that we may see the development of more banded structure and patchy clouds as the planet's year progresses." Some scientists have speculated that the winds of Uranus are not symmetric around the planet's equator, but no clouds were visible to test those theories. The new data will provide the opportunity to measure the northern winds. Hammel and colleagues expect to have results soon.